The week between Christmas and New Year is the week that ‘doesn’t count,’ you can consume copious amounts of chocolates, bubbly, mac & cheese, pizzas and the calories just don’t count, its fantastic. But if you feel like you have gorged slightly too much this recipe will blast you out of your hangover and leave you feeling slightly cleansed and restored, so much so you can follow with a large slice of left over Christmas cake. The base of this soup is using the last bit of the left over turkey – its bones. If turkey is not on the menu then use any left over bones you want – chicken, beef, lamb even goose. You can also go to the butchers and purchase, very cheaply, bones just to make your own stock (if so we would suggest roasting the bones before hand to get a deeper, richer flavour). And while you are at it you may as well make as much as you can fit in the pot and freeze it, as there is nothing in the world better for you – it is great for immune boosting and is packed with vitamins and minerals as well as a wonderful stomach soother. You want to put the whole carcass in the largest pot that you have, add onion, garlic, pepper corns, celery, bay leaves, thyme and a couple of table spoons of cider vinegar then cover with cold water. Bring to the boil then reduce heat and simmer for 2 - 3 hours, sieve and cool (once cooled in the fridge you might have to scrape off the fat layer – save this for cooking your roast potatoes!). We are travelling to Mexico for our chillies (sadly not literally) and using smoke-dried jalapenos called chipotle. We have used chipotle chiles in adobo – smoky, delicious and plump in an adobo sauce – then whiz it to a paste (most supermarkets have, if not then www.coolchile.co.uk or www.mexgrocer.co.uk have), a good pantry staple to have around. If you can’t find them then chipotle paste is basically just the same. Its fun to serve this with optional toppings, we like to use chopped avocado, spring onions, lime, sour cream and coriander as well as left over shredded turkey. Heat the olive oil in a pan over a medium heat, add the onion and garlic and sauté for 5 minutes till starting to caramelize. Add the coriander seeds, oregano, and red pepper and cook for a further few minutes. Add the chipotle and stir to release the flavour, then add the white wine and stock. Reduce heat and simmer for 5 minutes or so. Add the lime, honey and seasoning. 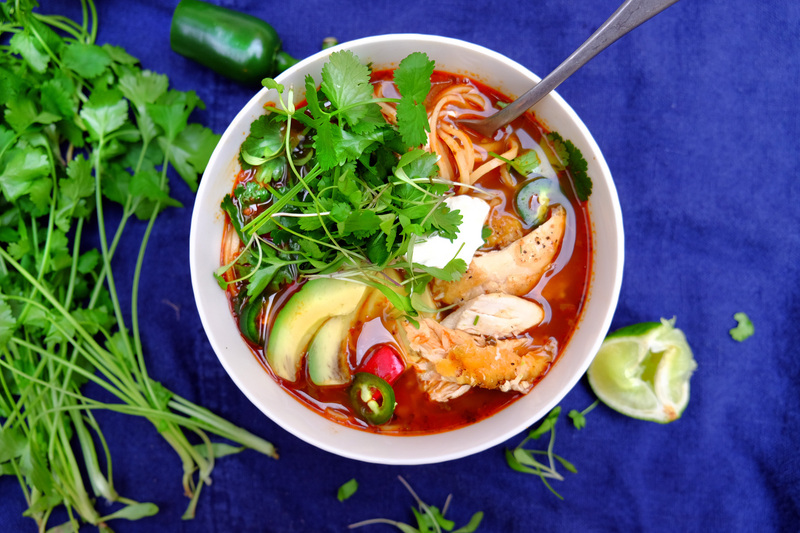 Divide the noodles between the bowls and pour the soup on top, finish with avocado, fresh coriander and shredded turkey – and any other add-ons you want!